ENERGY STAR certi ed models exceed government standards to help conserve natural resources and save money on your utility bills. Clothes will get the fabric care they deserve with this ENERGY STAR certified front load washer from Whirlpool. Featuring Precision Dispense to release detergent at just the right time for optimal cleaning, this 4.5 cu. ft. energy efficient washer also provides enough room to wash over three baskets of clothing in a single load. The Smooth Wave stainless steel basket in this front load washer helps to prevent fabrics from fraying and snagging while the Cold Wash cycle gently lifts stains while protecting clothes from heat damage. The Sanitize cycle with Oxi even eliminates 99.9% of common household bacteria. can you fit a queen size comforter in washer and dryer? According to the EPA Energystar web site..... They give it an IWF (Integrated Water Factor) rating of 3.2, the lower the better/more efficient. They get that by factoring gallons per cycle divided by cubic foot capacity. In this case since we know the capacity is 4.5 cubic foot, times that by the IWF rating of 3.2 equals 14.4 gallons. A 3.2 is very very low. In researching washers a few weeks ago, I don't think I've run across much lower, sorta recall seeing some as low as 13.8 gallons per cycle. For comparison, most top loader HE washers were in the 17-20 gallon range, IWF's of 3.5-4.3. Is it normal for the clorox box be filled with clean water up to the fill line when your wash is completed. They are telling me that this is normal....but is it? Do I have to dump this excess water every time I wash my clothes? Yes totally normal. you don't want to leave bleach or pass pure bleach even through plastic piping in that thing so it just uses a little bit of water each time to flush the bleach out. No worries! Yes it has a place on the top left to add fabric softner, detergent and bleach. It is automatically released during correct time in wash cycle. 4.5 cu. 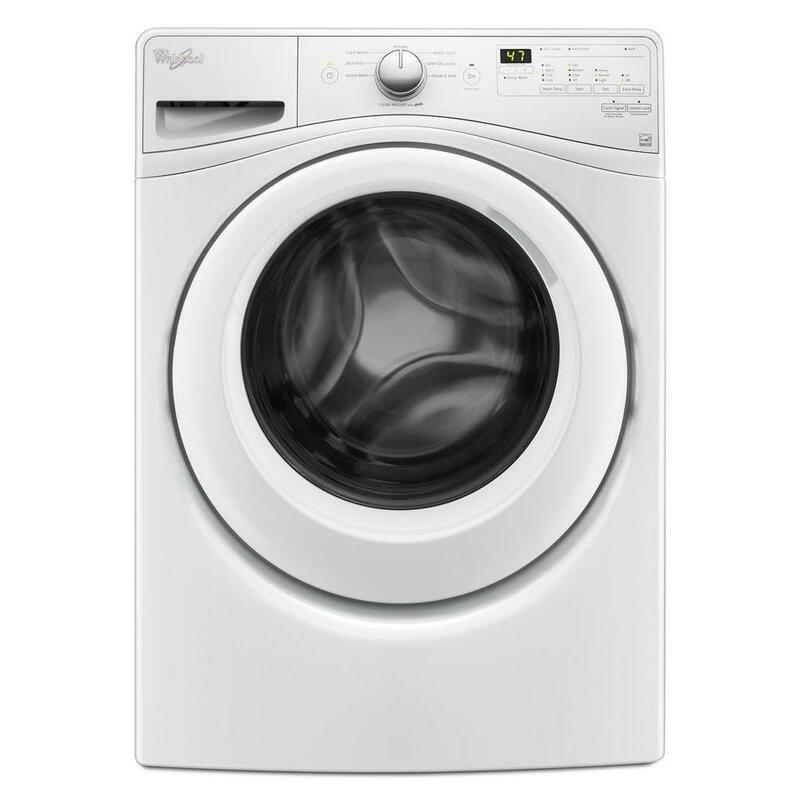 ft. Stackable White Front Load Washing Machine with Adapative Wash Technology, ENERGY STAR is rated 4.5 out of 5 by 5352. Rated 1 out of 5 by baddata from the door seal is a giant rubber pocket for crud and mold I replaced our frigidaire Gallery series front end washer with this Whirlpool Duet. We have a lot of dirty clothes because we live on and run a farm. The door seal on the Duet is a horrible design. It catches small items in the laundry and also holds in dirt and debris so you are constantly rinsing your clothes in dirty water.The small items get destroyed by the washer when they catch in the seal during the spin cycle. WE've had lots of torn up clothes come through the washer. Also water stays in the seal and eventually you have mold everywhere in the seal. I had to replace seals in both the frigidaire and whirlpool and the design of the seal on the frigidaire is much superior to the whirlpool. It's creases are much smaller on the frigidaire, so it won't catch dirt, small items of clothing (childrens clothes, socks, dish towels etc) and it won't grow mold! I wish I'd stayed with a frigidaire over this one, but the duet was so much cheaper as it was on sale because it was a return. Rated 1 out of 5 by Hannah1 from This is a disposable washer that is not designed to be maintained or cleaned. Parts are expensiv... This is a disposable washer that is not designed to be maintained or cleaned. Parts are expensive. About every six months I have to clean kid socks and hair out of the pump inlet screen. To do that I have to remove the top of the washer, remove the soap dispenser, remove the control panel, remove the door lock, remove the spring that holds the boot to the door (which is aggravating to reinstall as it slips off under tension) and remove the front panel. Next the screen is screwed in sideways under the center of the washer. Since it cant drain you have to manually remove the water with a shallow pan which takes about 25 trips as the drain is almost resting on the bottom panel. You have to be a contortionist to remove the right angle screw cap. Once the filth is cleaned out then comes the hard part tot put it together. A simple small door at the front would have eliminated all this. Clearly this washer is designed to be used for only a couple of years and thrown away, an environmental travesty! Rated 3 out of 5 by heppa from My first HE washer replaced a 12 year old top loading agitator style unit. It was used once or tw... My first HE washer replaced a 12 year old top loading agitator style unit. It was used once or twice before I went on a beach trip a shortly after delivery. Returned home and the leaking started immediately. While I can't yet speak to the washer performance, I CAN say that the delivery and installation guys caused the problem. They were courteous and on time, and removed the old units. They performed an all-too-brief "leak test" that I signed off on. However, the cold water input valve on the unit was the source of the leak because the installer stripped the threads on the cold water input valve during installation. The valve is a poorly made piece of plastic that costs $78 to replace on a $750 machine. Home Depot recommends you buy stainless steel hoses to supply the water to the washing machine, but why bother since you are simply connecting to a way-too-soft plastic valve that should have been made from stainless steel? So I have tons of laundry and a service appointment to repair the brand new unit. . Rated 5 out of 5 by Bob from This is our second Whirlpool front loader and replaces our duet. They look identical. This is a g... This is our second Whirlpool front loader and replaces our duet. They look identical. This is a good basic model washing machine. No frills which is exactly what we wanted. We are a family of five three adults two teenage boys. I wash twice a week zo this is my work horse machine. It uses very little water, we noticed a 50% savings when switched to front loaders. Thats a big deal whwn you pay for water and sewage. Final spin is between 1200 and 1300 rpms cutting down on drying time and saving us even more on the electric bill. As far as stain removal its average. Deep stains will need to be pretreated with your favorite stain removal product and elbow grease. The normal cycles setting takes 35-40 minutes. I love that! The soap dispenser on this machine leaves very little water in it. Thats a big improvement from from the duet we had, it left the the bleach and fabric softener full of water, that leads ro mildew if you aren't careful. The jingle at the end of the cycle is cute and preferable to the buzzer of old. In conclusion I like this machine. It gets the job done quickly and efficiently. Rated 1 out of 5 by Nope from Read before buying Installed as directed, washer on bottom/dryer on top. Impossible to service without paying for two techs - dryer must be lifted down and away to even diagnose washer. Door locks closed in a variety of circumstances and CAN’T be opened even by a tech without removing the dryer on top. Terrible design - there used to be a way to get door open from the front in older models. Tech couldn’t even find serial number - it’s inside the locked door. Asked whirlpool to send TWO guys for the service call, and only one was sent (don’t they know nothing can be done by a solo tech with this type of washer - a stacked one - when the door is locked???). Even when working, this machine and the sister dryer make a horrible, loud, strange spaceship noise with every button and to announce cycles are over. You cannot turn this off and it’s super annoying. There have to be better options out there. Rated 1 out of 5 by Al from I was excited to be buying an American made appliance. It was loaded at the store. I carefully tr... I was excited to be buying an American made appliance. It was loaded at the store. I carefully transported it and hooked it up to a fully operational 20amp breaker. There was Not A Flicker Of Life. I disconnected everything else on the circuit, unplugged an plugged it in again repeatedly, tried it on other circuits, tried various combinations on the control panel an basically everything I could think of...... Nothing Worked! I attempted to arrange for a service call by phone. After being on hold for at least 40 min. I tried the main menu, you guessed it they answer that line. However, I reached a real person in Tn. He quickly told be that the company recommends a separate circuit and if I didn't have one I would have to pay at least $125 for the call. When I tried to tell him what I had done, that I had just taken out a washer that worked fine for years on the circuit he hung up on me. I waited to see if he might call back.... no. I returned it. Clearly the thing was DEFECTIVE FROM THE START and THEY COULD CARE LESS. Rated 1 out of 5 by Anonymous from horrible I've had it about 3 years, and Its molded all on the rubber on the inside, and it smells, even if you bleach and clean it regularly. I've had even more problems with the matching dryer.